The new Petrie Allure is a full cow leather dressage with a 6 cm high bowl. The Dressage and All Purpose riding boot with zip at the inside front. The bootleg has an extraordinary elegant and slender fit. The new model Allure has been provided with the ankle support. A soft rubber padding prevents ankle pressure and assures minimal slipping of the foot.The bootleg has calf leather lining and is soft on the inside and hard on the outside. As the boot is modeled around the ankle as slender as possible , the sliding of the foot inside the boot will be limited to a minimum.The new model Allure has been provided with the ankle support (see photo) A soft rubber padding prevents ankle pressure and assures minimal slipping of the foot. The bootleg has calf leather lining and is soft on the inside and hard on the outside. 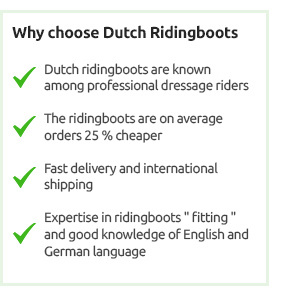 For the rider making high demands on his riding boot, the special comfort foot-bed and the compact modeling at the ankle, are very interesting. The Ago glued under-work is durable and the non-slip profile sole gives the boot the best possibilities.